I did some further reading on the I2CDev forum and found several threads on calibrating the MPU-6050 sensor and determining the optimal offsets. These, apparently, are specific to your device, as well to the exact orientation of the module, once it is installed. I found a significant improvement using the script by Luis Rodenas attached to this forum thread. 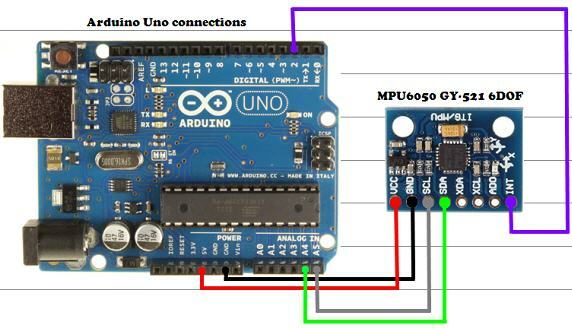 Below is the Arduino sketch version 1.1 (the most current at the time of this post). For best results, mount your module and run the script, while you have it stable in the position you will use it. For example, on a self balancing robot, have the robot upright in the optimal balanced position and keep it steady while the script completes and you see output with the suggested offsets. You then need to copy these offsets and overwrite the defaults in the sample code (around line 200, as mentioned above). // These offsets were meant to calibrate MPU6050's internal DMP, but can be also useful for reading sensors. // calibrate indoors and then use it outdoors. Best is to calibrate and use at the same room temperature. //Change this 3 variables if you want to fine tune the skecth to your needs. Hey I used your code and it is working perfectly. I want to know the theory behind the calibration code. Is there any place I can know this theory? basically from what I can see, the serial readout is the raw data from the chip. If you set this chip on a true flat surface, with all axis facing exactly 90 degrees to one another, and you get a reading of say x-10 y20 z -5, then you write the offset as x +10 y -20 and z+5, then you will get a reading of zero from all axis. That’s what calibration is all about, making sure your numbers are what they should be in a known environment. I hope this helped you to understand the theory of calibration. Now for a word: I am not long into arduino and all this. about 2 months. I’ve worked with machine tools a lot, I’ve built computers a lot, and I’ve tinkered here and there into electronic kits and experiment boards as a kid. I could be totally off base above, but I think I’ve got it right. I discovered that the cause of the problem for me was having the 6050 mounted upside down relative to gravity during the chip callibration. I had soldered the header block on the top, but using it in the bread board required orienting the chip upside down. That concludes the basic calibration of the MPU-6050; the sensor should now be more than accurate enough for most applications, such as self-balancing robots and quad-copters. Could someone help me and tell me how to do so ? Hi, I’m having this same error (‘buff_ax’ does not name a type”). Thanks for the complete code. I am a beginner and trying to learn, I have an MPU9250 and would like to cal liberate it, so please explain. I am using MPU9250_master libraries. Hi! The link to the calibration code is no longer valid; is it possible for you to email me or post the zip file/code please?